After a brief description of purse seining and the other methods used to catch yellowfin tuna in the eastern Pacific Ocean, some consideration s are made on the tuna--dolphin association and the solution of the problem of dolphin mortality in the eastern Pacific. The association has been observed in other ocenas, but the frequency of setting in the eastern Pacific is much greater. The mortalities of dolphins through fishing have declined from about 133 000 in 1986 to around 2600 in 1996. The impact of recent levels of mortality on the dolphin populations is not significant from the population point of view. The mortality levels for all the stocks are less than 0.1%, much lower than the 2% value used as a conservative (low) estimate of net recruitment. All dolphin stocks have population sizes between 400 000 and 2 200 000, and most have remained stable for a decade or more. Fishing operations can cause ecological impacts of different types: bycatches, damage to the habitat, mortality caused by lost or discarded gear, pollution, generation of marine debris, etc. A brief discussion follows, with a more detailed look at the bycatches. For convenience we can separate the effects of the fishery on the target species, and on other species. Of the different ways of purse seining for tunas, sets on dolphins catch tuna close to the optimum size to maximize yields and to allow for reproduction, and result in discards of tunas of less than 1% of the catch. Sets on logs catch small tunas, and result in the highest tuna discards (20--25%). School sets fall in the middle from the point of view of the sizes caught. Obviously, from the ecological point of view, sets on dolphins are the best way to harvest yellowfin tuna. After a discussion of the different ecological impacts a fishery can cause to other species on the habitat, a comparison is made of the bycatches generated by the different types of purse seine sets. Billfishes, sharks, mahi-mahi, wahoo and sea turtles are taken as incidental catches by purse seiners. Log sets produce, by far, the largest bycatches, followed by school sets and dolphin sets in that order. The bycatch levels in log sets are usually tens to hundreds of times those in dolphin sets. The difference can be attributed to the selection caused by the speed of movement of the tuna--dolphin group (slow-moving species or individuals cannot keep up with the group), an effect that may be magnified by the chase that precedes the dolphin sets. Log sets, on the other hand, are made on a drifting community. 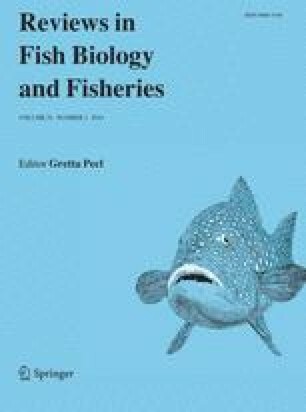 The alternatives left to the fishers if they were forced to switch from the current fishing methods to others are briefly discussed, considering their feasibility, and comparing their ecological costs. From the ecological point of view, and considering that the dolphin mortality is clearly sustainable, the impacts caused by the other types of sets, especially log sets, could be more significant than those caused by the dolphin sets. Some of the species taken in log sets are endangered (e.g. sea turtles), others have unknown status and potential vulnerability because of their low reproductive and juvenile survival rates (e.g. sharks). Overall, the biodiversity of the eastern Pacific appears to be better preserved by a fishery directed to dolphin sets than the other alternatives proposed for the purse seine and for other gears.